This tiny bird (110 mm total length) just caught a spider-like insect, but it is confronted with a juicy bug nearby. In the end, the bird decided that a bug in beak is worth two in the grass. The 400 2.8 IS + 2x TC’s minimum focus distance of 3 m allows amazing magnification at 800 mm…. perfect for small birds such as this. Habitat – Ricefields and wetter grassy areas. Shooting info – Candaba wetlands, Pampanga, Philippines, August 11, 2009, Canon 5D MII + EF 400 2.8 L IS + Canon 2x TC II, 800 mm, f/8, ISO 200, 1/500 sec, manual exposure in available light, bean bag. 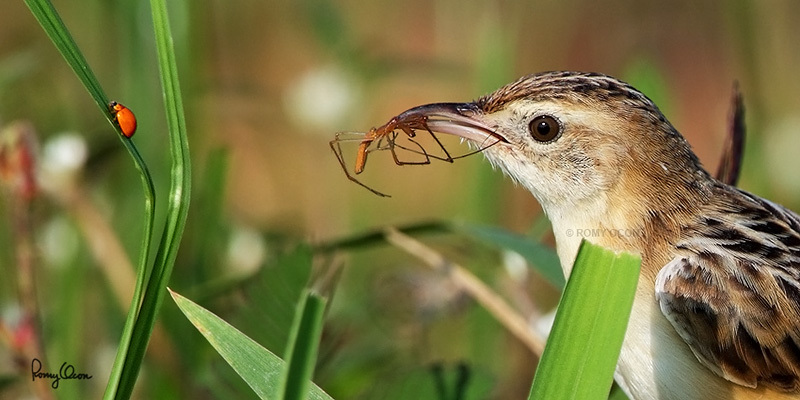 A short footage of a Zitting Cisticola filmed at Candaba wetlands.